I am inspired. This month I interviewed some top-notch animators and learned that I could make decent animation movies right in my living room! Giving animation tips are Joel and Thomas Moser, who animated the KIDS FIRST!® Kids for Peace title, A Life of Death; and Rob Hudnut, Executive Producer for Mattel Entertainment, which produced the KIDS FIRST!® Film Festival titles, Barbie and the Magic of Pegasus and Fairytopia. These Mattel titles, along with many others, are nominees for the KIDS FIRST!® awards. The winners of the awards will be announced November 19, at a special event during the Starz Denver International Film Festival. Go online to http://www.kidsfirstmedia.com/nl/html to place your vote today! As always, I welcome your input. If you have comments on titles we have endorsed; notices of awards, publications, and products; or suggestions for articles...Contact Chris. So many films, so little time. That's all I can say this month as we finalize our selections for our fourth quarter film festivals. Having screened every single one of the more than 100 we've selected for this quarter myself, I can honestly say that our line-up for the last quarter of the year is nothing short of spectacular. You are going to love these films! Our new acquisition partner, withoutabox.com, has helped us reach out to their more than 50,000 filmmaker members and we've gotten a deluge of submissions from independent producers for this quarter, from both students and adults. Independent productions such as "The Peace Tree" and "Raju and Me" are two outstanding productions we've added to our Kids for Peace collection. We're premiering the "Care Bears Big Wish Movie," offering a sneak peek at the new "Pinky Dinky Doo" television series from Sesame workshop, and showcasing a special edition of "FernGully," one of the best environmental children's films of all time. I'm thrilled to announce that KIDS FIRST! and the Denver Film Society have teamed up to present the sixth annual KIDS FIRST! Best Awards. Fifteen categories—plus a Best of Fest award—will honor works by studios and independent producers during the second weekend of the 28th Starz Denver International Film Festival™ (SDIFF28) on Saturday, November 19th and Sunday November 20th. The 15 awards are divided by age and category, each category having four age groups: 2-5; 5-8; 8-12; and 12-18. The categories are: Best TV Series; Best Feature; Best Independent Short; Best Independent Series; Best Independent Feature. There are also two student categories for Best Student Film by students in grades K-12 and Best Student Film by College/Graduate Students which are voted by a panel of peer jurors. For a complete list of nominees, and an opportunity to cast your vote, visit www.kidsfirst.media.com. Producers, remember that October 15 is our next submission deadline for both KIDS FIRST!® endorsements and KIDS FIRST!® Film and Video Festival titles. You may submit a title at KIDS FIRST!® or at www.withoutabox.com. To keep up with the fast-paced growth at KIDS FIRST!®, we offer juror training online. If you or someone you know is interested in becoming a KIDS FIRST!® juror, now's a great time to get started. There is a minimal $40 fee for the training, which is fully refunded after you have been active as a juror for six months. Jurors keep the titles they review and approve. What a wonderful way for teachers, librarians, parents, daycare providers and others involved with children to help KIDS FIRST!® while building their own quality media library. To register or get more information, please click here. Wai Lana combines ancient yoga relaxation techniques and quiet music to bring a deep sense of calm and inner balance to children. 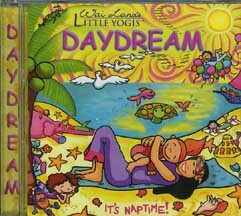 Whether your kids are too active or just need to rest, the Daydream CD will introduce them to the benefits of yoga. Includes two tracks, each containing guided relaxation, original songs, and recordings of ocean aves. From Wai Lana, host of the long-running PBS series Wai Lana Yoga. Adult Jurors' comments: Peaceful and nice. Encourages relaxation and imagination; good nap time CD for a daycare or bedtime music. Soothing voice wraps the listener with messages of love and peace. Kid Jurors' comments: Put them to sleep. "I like to sleep. It's nice to listen to when I'm going to sleep." "I thought about getting cozy and resting." Found the music pleasing: "The music is haunting." "The lady sings pretty." Titles receiving the highest scores are given a three star rating. Ttles that meet or exceed the criteria receive a two-star rating. Titles that meet the baseline criteria but require some extra consideration on the part of the viewer a one-star rating. *** ALL ABOUT JOHN DEERE FOR KIDS, PART 2. Learn fun and fascinating facts about farming and see how grapes and pumpkins are harvested, and watch giant John Deere combines at work. Adult Juror Comments: Delightful. Well paced. Engaging and entertaining. Shows lots of equipment that will appeal to kids who are interested in farming or big machinery. It explains things well and shows real video footage of the implements. Loved the music. "Had me humming the John Deere song for the rest of the day. I like that the narrator is a child.” Kid Juror Comments: Great movie with good pictures, music, information and held the kids' interest. "I really liked it. The music is good. It is very interesting and I learned a lot." "I would definitely watch it again." "I viewed this with my two-year-old nephew who lives in the city and doesn't get to see farm machinery often. He was fascinated by this and went to his toy box and pulled out a green and yellow truck and put it up on the TV." DVD. 50 min. ; $14.95; Age: 5-8. TM BOOKS AND VIDEO. INDEPENDENT SHORT FOR AGES 5-12 ** MUFFIN AND PIE. A super competitive little girl finds the ultimate challenge in picking a partner for the three-legged race at the upcoming family picnic. According to her little brother, Anita is all about 'winning, winning, winning.' So what if he's right? But when the chance to prove herself at the family picnic arises, the pressure is on to choose the perfect team-mate. Will she succeed in choosing a winner? Only time and some pie will tell. Adult Juror Comments: Consistently amusing camera angles. Extremely expressive characters throughout. Mirrors what a lot a kids go through: competitiveness, sibling antagonism, an overly peppy Mom, detached Dad. Family reunion is full of cliches but it is all so broadly drawn and so over-the-top that it's hard for the protagonist to take herself, or her family, seriously. Sound quality uneven, otherwise, good production qualities. Excellent sample of student work. Kid Juror Comments: DVD. 18 min. ; $0; Age: 5-12. MAUREEN GROSSER. Care Bears Big Wish Movie. A. 75 min. F.
DVD SNEAK PEEK FernGully: The Last Rainforest Special Edition. A. 76 min. Community Cinema - Kids Fest at Beaumont Civic Center in Beaumont, Texas August 20th - 21st, 2005, was a smashing success. From face painting to give-aways to fantastic KIDS FIRST!® endorsed films all day long in a large tent, this Clear Channel-sponsored-event was a treat for parents and children alike. Missed it? Don’t worry. They plan to do it again next year. Michigan Governor Jennifer M. Granholm signed legislation that that will make the sale or rental of mature or adult-rated video games to children illegal. Animating a movie. Think it’s out of your league? You might want to think again. You don’t need major studios or millions of dollars worth of equipment. Animation takes viewers on journeys beyond their wildest dreams, and the journey can begin right in your living room. Rob Hudnut, Executive Producer for Mattel Entertainment, and brothers Thomas and Joel Moser, animators for Sony Pictures, Warner Brothers and character artists on the VH1 show, Illustrated, give us a peek into their world of animated blockbusters. They also recommend some affordable programming and informational tools to help you unleash your own creativity. It all begins with paper and pencil. Joel Moser alleges that animation is an illusion of life, so an animator needs to draw characters that move and act like people do. Thomas Moser adds that the computer and the software are tools. You must also be a very keen observer of how people and animals behave so you can translate realistic actions into animation. If you’d like to try computer animation, and your budget is limited, both Thomas and Joel recommend Macromedia Flash. It is easy to learn, and you can se it to create an entire piece of animation without other programs. In fact, the Moser brothers are currently in production of a full-length feature film, Firedog, created completely in Flash. Flash offers education discounts to students and teachers, so you can get started with a very small investment. Flash also offers a free 30-day trial (Flash). Maya, software for 3D animation, is another affordable program recommended by the Mosers. A free, learning edition of Maya is also available at Maya. Have you ever set up a scene and shot stills with your digital camera, changing the scene slightly for each exposure? When you watch the pictures in a fast slide show, it appears as if the scene is moving. This is called stop motion animation, and Fisher-Price uses this method to create their “Little People DVDs.” Hudnut admits it takes a long time to animate stories this way, but kids like it and that’s why Fisher-Price does it. Another computer animation alternative is CGI, a program many call the offspring of stop motion. Mattel was the first to produce movies with humans presented in CGI. The first four Barbie movies were made using a computer software called Softimage 3D. As technology progresses, Mattel upgrades their software to make their animated characters more realistic. They produced their most recent Princess movie using a new ersion of that software called XSI. With this software, Mattel bases their motion on the movements of real people. This method is called motion capture. The motion actors wear unitards that have 40 optical sensors on them. The animators then put their animation models on top of the movement data and - presto! - the characters move like real people. Don’t let this techno-information overwhelm your creative impulses. Hudnut and the Moser brothers insist that great animation begins with a solid story and imagination. According to Joel Moser, today, with the Internet, it's possible to learn many things in your home for free. There's a wealth of information out there and many artists who are willing to help others learn. With all this information at our fingertips, Joel believes that the generation that is growing up with the Internet will be the most artistic generation of all time, because they have access to information that wasn't available just ten years ago. Judging from the productions that we see in our offices, we at KIDS FIRST!® are inclined to agree. Glittering Galaxy based on Astronomy for Elementary Age Materials: Black paper; white chalk or gel pen; glue; salt or sand or glitter. Go to craft page at www.kidsfirst.org. October 14-15, 2005: Ithaca, NY. Oct. 22, 2005, from 8am - 4pm. : Cambridge, MA. Media Literacy Symposium at MIT. Features schools that are implementing media literacy curricula in the K-12 learning space and in after-school programs. Contact Alan (mailto:[email protected]) for information. Reel Grrls is recruiting 50 girls, ages 14-18, who are interested in the arts, filmmaking, and activism, to participate in "Girls in the Director's Chair." Scholarships are available. Read More. October 8-9, 2006 (Columbus Day weekend, exact days TBD): Burlington, Vermont; Bi-annual conference of the Action Coalition for Media Education (ACME) at Champlain College. To add your event to this list, please send a notice to Chris. CQCM evaluates feature films, television programs, videos, CD-ROM, DVDs and audio recordings. For an application form and application deadlines, visit our website at http://www.kidsfirst.org, call our office (505.989.8076) or send an email to Our Jury Coordinator.